This vintage writing desk was a recent rescue from the deep dark 1970's I believe! Every lady needs a place she can write those thank-you notes, and store her secret love letters from her admirers! If you haven't caught the Farmhouse Decor craze yet, it means you haven't fallen in love with Chip and Joanna Gaines from the TV show 'Fixer Upper'! I am not a complete convert, but I love the upcycling aspect of the home re-do's and the neutral tones of the Farmhouse decor. Because of this style, and the introduction of the fabulous new Edison bulb, I decided to give it a go! ​Click here to see the Thread Spool Lights tutorial! This lovely pale green and silver lamp was a fluke as I found the base lamp in a thrift shop, and the shells on the beaches of Savannah, GA. I had to wire, and piece together the back shells which took me weeks, only to find the right shells on my Palm Beach sands to match! 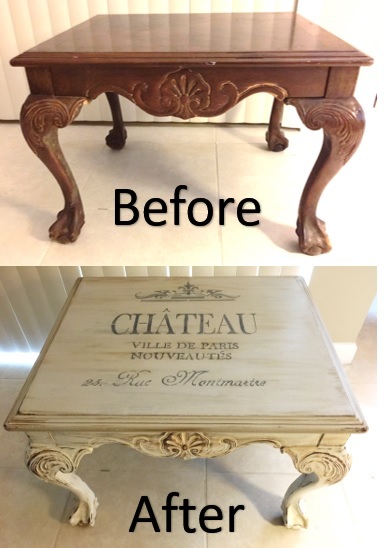 Chateau Table - This lovely side table ( or even a sofa table) was rescued from boredom and given the full treatment to bring it back to life! I used my own chalk paint recipe* which goes farther, and is a more custom color process than purchasing loads of cans that I may only choose once. The tutorial (under the Inspirational Projects tab) will give even beginners a real step-by-step process to see how to transform even your dreariest of pieces no matter the size or use. So, follow along, and let me know how you have used these steps to produce your own little treasures! ​Go to the "Inspirational Projects' tab for the process on this project... (sorry for the tutorial link confusion!). Comment if you have questions, and PLEASE share your own experiences!!! I would love to see your own transformations too!!! *Chalk paint recipe - Mix 1/3 cup of Plaster of Paris and 1/3 cup of cool water; stir until completely smooth. Mix that with 1 cup of latex paint and stir thoroughly. I stored in small jars and plastic containers. Jars worked better.